Sussex Community Development Association awarded £9,864 to create a range of recreational group activities in and around the South Downs National Park. Rampion and the Sussex Community Foundation have announced that the first grants have been distributed from the £3.1 million community fund set up by the offshore wind farm last autumn. A complete list of grants awarded to 46 groups from across East Sussex, West Sussex and the city of Brighton & Hove can be found here. Chris Tomlinson, Rampion’s Development and Stakeholder Manager said: “We have been absolutely delighted with the response from community organisations who have put forward many innovative and exciting projects in support of a diverse range of community groups. The Fund is designed to help local projects, particularly those with links to the environment and ecology, climate change and energy, as well as those that work to improve community facilities, with some consideration for energy generation and use. The Rampion Fund is managed by Sussex Community Foundation, a local grant-making charity. It supports the local community, from Littlehampton Harbour in the west, to Beachy Head in the east and up to the A272 near Twineham in the north. The deadline for the next round of applications to the Rampion Fund is Friday 4 May, 2018. For more information, visit the Sussex Community Foundation website or call 01273 409440. Pictured representing Sussex Sailability are David Carroll, Patrick Soulijeart, Adrian Cumberworth, Tony McCoy and Oliver Forsyth along with Hannah Clay, Programme Manager at Sussex Community Foundation and Chris Tomlinson, Development and Stakeholder Manager for the Rampion Offshore Wind Farm. Care for Veterans £50,000 Care for Veterans provides long-term nursing care, rehabilitation, respite and award-winning end of life care to disabled ex-service personnel. This grant will fund the design, installation, and maintenance of the solar panels system. 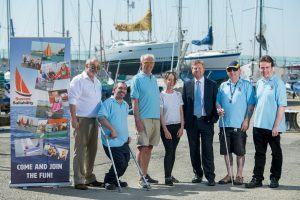 Sussex Sailability £22,360 To replace and equip the safety boat and ensure it is maintained to provide safety cover to disabled sailors on the River Adur and sea. Brighton & Hove Food Partnership £20,000 To support the costs of launching a city-central community kitchen. Brighton & Hove Energy Services Co-operative £11,000 To purchase and kit-out an electric van which will enable BHESCo to reach the most deprived local communities, aiming to help reduce fuel poverty in the area. Bee in the Woods Community Forest School £10,475 To design, create and launch a community woodland and garden site as a social enterprise. We are Food Pioneers CIC £10,000 To fund an innovative seaweed project ‘From the Sea Health’, a year-long events programme including seaweed cookery, bathing and pop-up shops as well as conducting a feasibility study to scope seaweed harvesting and farming off the coast of Worthing. Brighton Surf Life Saving Club £10,000 To purchase an Arancia inshore rescue boat and engine. World Cetacean Alliance, Brighton (WCA) £10,000 The WCA is the world’s largest marine conservation partnership. This grant will seed fund an Education Officer to run the new visitor centre and engage the local community and tourists on Brighton Beach, as well as on board tour boats. Bramber Brooks Management Committee £10,000 To create a new nature reserve at Bramber Brooks. Shine for Life £10,000 To fund 10 tailored programmes of equine assisted therapy to adult clients with mental health issues. Sail Boat Project CIC £10,000 To fund a programme of 15 sailing activity days for 90 people from disadvantaged communities living in coastal sections of the community benefit fund area. Lancing Sailing Club £10,000 To help purchase a small group of durable sailboats, to be used in a series of low cost training days. St James’ Trust (Seaford) Ltd £10,000 To enable installation of a new staircase and lift and to change a garage to a meeting/art room to expand the use of the centre. The Real Junk Food Project Brighton £9,982 To employ a new, part time stores manager which will help to further minimise food waste through better stock management and increase the number of meals served. Shoreham Rowing Club £9,962 To purchase a new coastal rowing four boat to train and develop new members and for established members to race within the Coastal Amateur Rowing Association Regattas. Marine Conservation Society £9,900 To help to raise awareness of Kingmere Marine Conservation Zone and educate the local community through a website, website promotion and permanent interactive signs along the seafront. Armada Trust £9,890 To support an innovative and engaging Rampion Schools Tour, with workshops delivered and led by one of their trustees, local kitesurfer and athlete Lewis Crathern. Brighton Sailing Club £9,886 To support the clubs effort to maintain, grow and diversify their active sailing community by securing the operation of the safety boat engine and refurbishment of their fleet of pool boats to provide regular, safe and accessible Sunday racing and other sailing activities to the membership. Arun & Chichester Citizens Advice Bureau £9,869 To fund an experienced advisor who will be able to see people referred by the energy efficiency worker and provide an income stabilisation and budgeting service in order to move people out of fuel poverty. Sussex Community Development Association £9,864 To help to co-create a range of recreational group activities in and around the South Downs National Park that benefits health and wellbeing alongside building social connections. The Appreciation Society CIC £9,860 To help develop a community design project ‘A drop in the ocean’, an installation along the Volks Railway Fence on the seafront in Kemp Town. Brighton Permaculture £9,790 To help expand and establish six traditional community orchards that are being planted in or adjoining housing estates in East Brighton with local residents. Worthing Rowing Club £9388.89 To facilitate the restarting of schools’ indoor rowing clubs. Seaford Lifeguards £8968.41 To purchase life-saving and personal protective equipment for volunteers. Green Centre CIC £8,650 To finance the first-ever One Planet Living curriculum, the gold standard in sustainable living, delivered through the centre’s website, an exhibition and workshops. Esteem £8,500 To help fund the salary of a part-time project worker who will provide one-to-one professional support for approximately 100 young people who are in crisis in the Adur & Worthing district. Age UK East Sussex £7,372 This grant will support day clubs in Peacehaven and Newhaven. Steyning Downland Scheme £7,350 To help to enhance land around the new ‘gateway’ building. This will include an outdoor classroom to boost the events programme, a permanent art installation, wildlife friendly landscaping and funding to help qualify two volunteers to City & Guilds NPTC Level 2 in chainsaw use and to produce an awareness raising leaflet. Lancing Kitesurfing Club £7,310 To help provide free training for local children through powerkite and beach awareness sessions. To build a pool of skilled volunteers to support this training and continue Lancing Kitesurfing club. 15th Brighton Scouts £6,569.28 To fund the repair of the scout hut, protecting the fabric of the building to ensure its continued use by the scout group, as well as extending its use to other community groups. Synergy Creative Community CIC £6,360 To fund an art exhibition and series of public events to explore two significant themes: the fight against climate change and the need for good mental health. Centre for Ecotherapy £5,500 This grant will pay towards running costs of social and therapeutic horticulture programme places, to develop a volunteer programme and to set up monitoring systems. Tarner Community Project £5,000 To support essential maintenance and improvements to the group’s building and fund maintenance and development of the community kitchen garden. Cycling Without Age £5,000 This grant will support salary costs. Grow Project £5,000 This grant will enable the group to run two eight-week courses called The Season, where groups of 12 participants travel to the National Trust’s Saddlecombe Farm and other locations in the South Downs and carry out a wide range of activities. Sustainable Sussex & South Downs Leisure Trust £5,000 To support planning and community engagement processes to help utilise a space within the farm to become a nature trail, outside learning space and growing area. Association Cybèle (UK) £4,700 Association Cybèle organises diep~haven, an annual cross-channel arts festival in East Sussex and Normandy. The grant will support an artist-led education project and exhibition with local school groups in Newhaven, which connects children to their immediate natural environment, the UNESCO Biosphere, and raises questions about environmental change for both the students and wider public. ORPS (Ovingdean Residents & Preservation Society) £4,000 To support the cost of running the first annual Ovingdean Green Festival in June 2018, giving impetus and support to the debate establishing the Ovingdean Green Conservation Area. South Downs Leisure £3,858 To help with the cost of running The Green Dreams community event, including environmental conservation workshops, interactive wildlife experiences and free mind body sessions including tai chi and yoga. Worthing Thunder £3,500 To help fund the delivery of coaching and participation in basketball to schools and disabled groups within the area. Steyning Community Orchard £2,200 This grant will pay towards two 4m x 8m gazebos, eight 1.8m folding trestle tables, a multipurpose pruning saw and fruit picking pole as well as a battery powered strimmer. 3rd Worthing (Broadwater) Scout Group £2,000 To help purchase new equipment and training, to enable the group to offer rock climbing to their young people. Lancing parkrun £2,000 This grant will enable Lancing Park Run to register with parkrun and set up a new event. Friends of Shoreham Beach £1,800 To fund a professional insect survey to gain a better understanding of insect plant relationships and assist in the protection of both. Brighton & Hove’s Wildlife Forum – House Sparrows Project £1,000 To help fund capital items such as nest boxes, bird food and wildlife seed. Portslade Green Gym £500 To help cover costs such as tools, clothing and insurances, allowing volunteers and friends of groups to access the service without needing to pay for each Green Gym visit.